Make sure you “LIKE” our Facebook page so you can keep up with the latest news in Area 9! Add us to your interest lists to make sure our posts show up in your news feed. Have you mailed your Area 9 Officer Election ballot? Ballots must be postmarked by May 23, 2014. 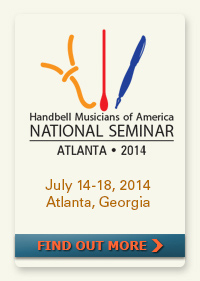 It is time once again to elect our leaders for Area 9 of the Handbell Musicians of America. We will be electing a new Chair-Elect, Secretary, and Treasurer. The elected offices will serve a term from October 1, 2014 until September 30, 2016. In addition, the Chair-Elect will serve a two-year term as Chair followed by a two-year term as Past Chair. Voting members please check your mail for the envelope containing biographical information for each candidate and your ballot. EARLY BIRD REGISTRATION DEADLINE EXTENDED TO JUNE 1st! I was chatting with a fellow ringer the other day about attending Summit. They just couldn’t make up their mind. Together we discussed their “10 Reasons I’m not going to Summit” list – and came up with some solutions. 1. I missed the deadline. The early registration deadline had been extended until June 1! 2. It might not offer classes I want to take. Take a look at the classes being offered. Wow! They include everything from Bell Trees to the Best Ringing anywhere! 3. I can’t afford to stay in an expensive conference hotel. Any hotel in Ardmore is considered a conference hotel! You can select whatever price accommodations your budget allows. 4. I don’t want to drive a long way to the convention center. There are 2 hotels right next to the Ardmore Convention Center. You don’t have to go far at all! 5. I don’t want to pay for parking all the time. There is no parking fee as there was at the Arlington Convention center! No extra cost in Ardmore. 6. It is too far. Ardmore is just over the Oklahoma border on I-35. It’s only a couple of hours from Dallas-Ft. Worth and from most of Oklahoma. Also, make it a fun road trip. Bring a friend or bring your family. 7. Did you say bring my family??? Isn’t this a handbell conference/event? My family doesn’t ring handbells. AND it’s Father’s Day weekend. Summit 2014 has put classes into the schedule on Saturday afternoon for families! They can join in the fun and might even learn a little about having fun, music or maybe even bells. They don’t even have to be registered for the event. ALSO, on Saturday night there are special events for all attendees and family members (small fee for dinner for all). In addition to dinner, there will be Indian dancers & other treats. 8. Ok, I’m thinking about it, but what else could my family do while I’m at the rest of Summit? They would be bored in the hotel room. There are lots of things to do in the Ardmore area. There is Lake Murray, Turner Falls plus many more parks and lakes. Also go to visitors.ardmore.org for many more ideas. 9. I went to Summit 2012 and there weren’t any reading sessions. Reading sessions are back! There are 4, count them, 4 reading sessions. There are also 3 sessions of All Rings. There are many opportunities to experience new music. 10. Is there anything really special to experience other than this exciting line-up of classes? Wow! Are you in for a treat! The world reknowned Raleigh Ringers* are in concert on Friday night at Summit! You will also be treated to Abilene Gold! on Saturday and Tulsa Festival Ringers on Sunday! Oh, my! I have to send in my registration TODAY. I just can’t miss this opportunity! Be sure to visit the Summit 2014 Website Page for the full scoop and to download the registration form! *Tickets for the Raleigh Ringers are included with Festival Registration. Additional tickets are available online for non-festival attendees for $20.00 plus transaction fees.